Bourbon Courage (by Lion Heart out of Shine Forth, by Carson City), a versatile Grade 2-winning millionaire by an emerging sire-of-sires, stands at Anchor & Hope Farm in Maryland. Bourbon Courage was a versatile runner who captured the Grade 2 Super Derby at nine furlongs during the same season in which he won his first two career starts, both at six furlongs. He was a track record-setter at 6-1/2 furlongs, placed in eight Graded races, and finished in a photo for 3rd in the Breeders’ Cup Sprint-G1 while earning more than $1.1 million. Bourbon Courage’s second dam is a full-sister to Champion and Breeders’ Cup Juvenile-G1 winner Chief’s Crown. Bourbon Courage’s sire, Lion Heart, was himself a Grade 1-winning 2- and 3-year-old by the highly-respected Tale of the Cat, and Lion Heart is now an emerging sire-of-sires whose sons at stud include Kantharos, Line of David and Uncaptured. Both Kantharos and Uncaptured were top-class juveniles, and each is out of a Hail To Reason-line mare (as is Lion Heart’s Grade 2-winning juvenile son Azul Leon, whose broodmare sire is Cure the Blues) — Kantharos’s broodmare sire, Southern Halo, is responsible for current leading sire More Than Ready and for the deceased Saint Ballado, both of whose daughters should be a great fit for Bourbon Courage (Saint Ballado is already the broodmare sire of a stakes winner by Lion Heart), while Uncaptured is out of a daughter of the Kris S. son Arch. Arch, in turn, is the sire of Blame and Archarcharch; daughters of all three could work very well with Bourbon Courage, as could those of Kris S.’s former West Virginia sire son Prized (who is also already the broodmare sire of a stakes winner by Lion Heart) and those of Maryland resident Nicanor, whose sire, Dynaformer, is a grandson of Hail To Reason by Roberto. Roberto is also the sire of Red Ransom, whose son Hold For Gold produced the dam of Grade 3 winner and Kentucky Derby-G1 runner-up Firing Line, by a son of Lion Heart. Veteran sire Include, whose son Redeemed stands in Maryland, is not from the Hail To Reason sire-line but does have Hail To Reason in his third generation and three crosses of that one’s sire, Turn-To*, in his fourth generation; their daughters would also be intriguing with Bourbon Courage. Sons of Lion Heart are responsible for six stakes winners out of mares by sons of Mr. Prospector, from just 44 foals of racing age bred this way (an incredible 13.6%), while Lion Heart himself got four more stakes winners on that pattern. Mid-Atlantic-based sons of Mr. Prospector whose daughters could be tried with Bourbon Courage include Allen’s Prospect, E Dubai, Mojave Moon, Not For Love and Two Punch. Four of the ten stakes winners on this pattern are out of daughters of Carson City (including Bourbon Courage himself); daughters of leading West Virginia sire Windsor Castle (a grandson of Carson City) and leading New Jersey stallion Hey Chub (a Carson City son) offer interesting inbreeding opportunities with Bourbon Courage and are definitely worth trying given how well Lion Heart has done with this cross. There is an additional stakes winner by a son of Lion Heart out of a mare by Mr. Prospector’s grandson Mr. Greeley (by Gone West), while Lion Heart was responsible for Grade 1 winner Bradester out of a mare by Gone West’s son Grand Slam; this makes daughters of Grand Slam’s leading sire son Limehouse (in West Virginia) worth considering for Bourbon Courage, as would be mares by current leading Maryland sire Great Notion (by Gone West’s son Elusive Quality). There are a pair of stakes winners by a son of Lion Heart out of mares by grandsons of Unbridled (himself a Mr. Prospector grandson), whose sire-line has been represented in the Mid-Atlantic by Domestic Dispute, Fiber Sonde, Rockport Harbor and Unbridled Jet; daughters of all of which would make sense to try with Bourbon Courage. Other Mr. Prospector-line stallions who have called the Mid-Atlantic home during their stud careers and whose daughters could be tried with Bourbon Courage include Black Tie Affair[IRE], Charitable Man, Dublin, Petionville and Street Magician. Lion Heart got three Graded winners from just ten foals out of daughters of Seattle Slew, plus a Grade 1 winner out of a mare by Seattle Slew’s son Capote. Sons of Lion Heart are already responsible stakes winners out of mares by Seattle Slew’s son General Meeting and Capote’s son Boston Harbor, as well as a Grade 2 winner from a mare by Well Decorated, by Raja Baba, who represents another branch of the Bold Ruler sire-line from which Seattle Slew descends (and whose son Formal Dinner stood in Pennsylvania). There is also a Lion Heart Graded winner from a mare by Beau Genius, who is a grandson of Boldnesian like Seattle Slew. The success of Lion Heart and his sons with Seattle Slew-line mares bodes extremely well for Bourbon Courage’s prospects with the Mid-Atlantic’s large population of mares from the sire-line of Seattle Slew’s son A.P. Indy (whose son Pulpit is the sire of Purge, who is the broodmare sire of a stakes winner by a son of Lion Heart); this would include daughters of Buffum, Corinthian, El Padrino, Freedom Child, Friesan Fire, Jump Start, Malibu Moon, Oratory, Rock Slide, Scipion, Silver Train and Super Ninety Nine, all of which ought to fit Bourbon Courage well. A son of Lion Heart has produced a Grade 3 winning, multiple Grade 1-placed runner from a mare by Danzig’s son Lost Soldier, while Lion Heart himself produced three stakes winners from mares by three different sons of Danzig, including one by Boundary, whose son Big Brown is now in New York and whose daughters ought to work with Bourbon Courage (as will fillies by Big Brown’s son Dortmund, eventually — he covered his first book in Maryland in 2018). Lion Heart also has a Grade 3 winner and another stakes winner out of daughters of Danzig’s grandson Sea Hero; the other Mid-Atlantic representatives of the Danzig-line include former Maryland stalwart Polish Numbers, plus Outflanker (in Maryland) and current Pennsylvania sires Partner’s Hero and Rimrod (all by Danzig himself), as well as Weigelia (in Pennsylvania and a grandson of Danzig), mares by all of which can be tried with Bourbon Courage. There is a stakes winner by a son of Lion Heart from a mare by Awesome Again, who is a son of Deputy Minister (himself the broodmare sire of a stakes winner by Lion Heart). Deputy Minister’s sons Salt Lake and Touch Gold are broodmare sires of a Grade 3 winner and a stakes winner, respectively, by Lion Heart, and there is also a Lion Heart stakes winner from a mare by Regal Intention, a son of Vice Regent just like Deputy Minister. The Mid-Atlantic sources of the Deputy Minister sire-line include his sons Talk Is Money (Pennsylvania), Ghostly Minister and Yarrow Brae (West Virginia), plus Defrere (New Jersey), and his grandson Medallist (by Touch Gold) in Pennsylvania; their daughters are all worth trying with Bourbon Courage. Wildcat Heir, by the Storm Cat stallion Forest Wildcat, is the broodmare sire of a stakes winner by a son of Lion Heart. Storm Cat’s son Lion Hearted (not to be confused with Bourbon Courage’s sire Lion Heart) stood in Maryland while Cat Thief was in Pennsylvania, and Storm Cat’s grandsons in the Mid-Atlantic have included Etched, Fairbanks, Gators N Bears, Talent Search and Wiseman’s Ferry, all of whose daughters could be considered for Bourbon Courage. Danzig, Deputy Minister and Storm Cat all represent various branches of the Northern Dancer sire-line, and Lion Heart was also responsible for a Grade 1 winner out of a mare by Northern Dancer’s grandson El Prado (sire of current leading stallions Kitten’s Joy and Medaglia d’Oro, and grandsire of young Maryland sire Golden Lad). Damascus-line mares have had success when crossed with Lion Heart and his sons, as Lion Heart got a stakes winner out of a daughter of Time For a Change, and that one’s son Time Bandit is the broodmare sire of a stakes winner by a son of Lion Heart. Mid-Atlantic representatives of the Damascus sire-line have included Private Terms (by Private Account) and Swiss Yodeler (by Eastern Echo), both of whose daughters should match nicely with Bourbon Courage. Lion Heart has a Grade 2 winner from a mare by Meadowlake, who has a pair of sons in West Virginia, namely Luftikus and Meadow Monster, whose fillies can be tried with Bourbon Courage. 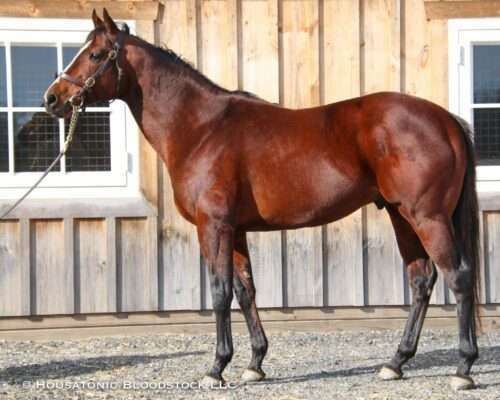 There is a Grade 3 winner by Lion Heart with Valid Appeal as a broodmare sire, and this In Reality sire-line is also currently represented by the likes of Successful Appeal and Tiznow; the latter has a son, Bullsbay, in Maryland, and his daughters could pair well with Bourbon Courage. Finally, former West Virginia sire Bop is by Rahy, who is the broodmare sire of a Lion Heart stakes winner, making Bop mares interesting with Bourbon Courage. Rahy is a son of Blushing Groom[FR], who is also the grandsire of the recent Maryland sire Orientate, whose daughters could make a lot of sense with Bourbon Courage, too, as could those of West Virginia’s During, who also traces to Blushing Groom[FR].